Now I see Kenya through the eyes of the people, the farmers, the backbone of this beautiful country. Having spent every day of the last 2 weeks traveling the dirt roads from farm to farm and eating in the homes of the happy and hard working Kenyans, to now sit poolside at a resort is a sharp contrast and frankly quite unnerving. Coming from Canada it's hard to get the perspective of how fortunate we truly are to have grown up in a developed and financially thriving nation. We take for granted the endless opportunities handed to us and still complain of the little things. Growing up I have always heard of the challenges faced in developing countries and learn of the foreign aid that large organizations and countries help provide for them. A common North American mentality about African poverty is that one individual's efforts would only be a drop in the bucket in improving such poverty. So why bother? Leave it to the large volunteer group efforts and let them worry about it. Then there is the question of the poverty trap, a spiralling mechanism that forces people to remain poor. If poverty is a trap, then some believe that a one time infusion of aid could make a huge difference for a person's life and set them on a whole new trajectory in life. This is philosophical matter with of course many factors that must be considered, but what about the quote we have heard endless times, "Give a man a fish and he will eat for a day. Teach a man to fish and he will always have a meal." What if education was the infusion of aid necessary to break the spiral? One man here opened my eyes to the reality of the situation and his name is Isaac Kaiyongi. Isaac is a dairy farmer near Meru, Kenya with 3 milking cows and he had attended a seminar we conducted this past week near his home. At these seminars we have attendance ranging from 30-100 farmers, men and women who come to ask questions about their cattle and learn from us on nutrition, breeding and milk production. Isaac attended a seminar the year prior and was back this year thirsty for more knowledge. He shared his success story with me and it is one that will stick with me forever. One year ago, Isaac was getting 17kg of milk per day from his three cows combined and was grazing them over the dry countryside to find forage. At the seminar last year he learned the importance of proper nutrition and the benefits of zero-grazing housing for the cattle. 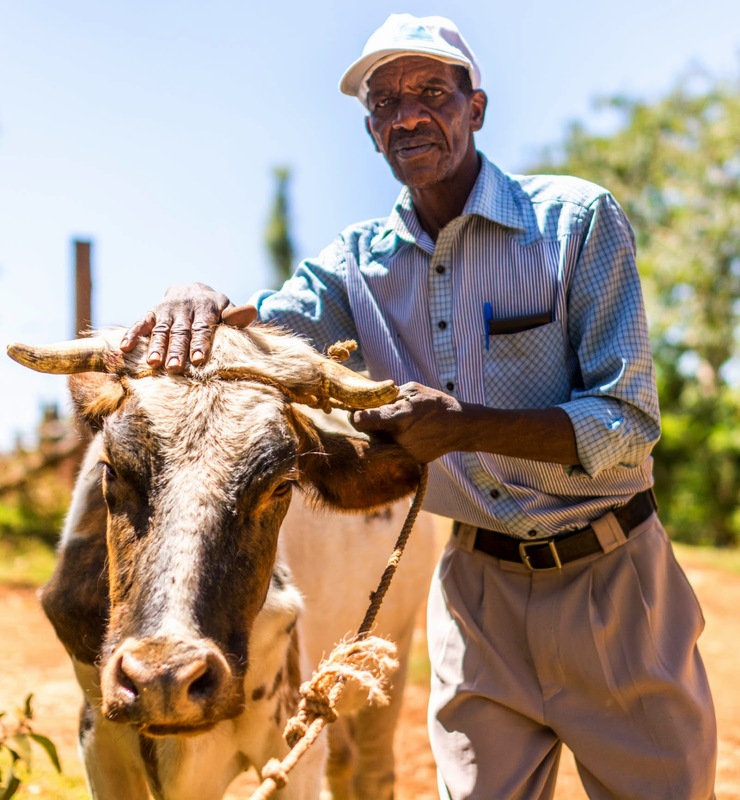 Isaac started feeding his 3 cows an adequate amount of dairy meal, he grew Napier grass and sweet potato vines on his farm to feed higher quality forages, and built them a zero grazing unit. Within this year his 3 cows went from producing a cumulative 17kg of milk to a dramatic 17-20kg of milk each. In Isaacs case, prosperity was achieved from the combined efforts of Farmers Helping Farmers, John VanLeeuwen, and the 2014 veterinary students. 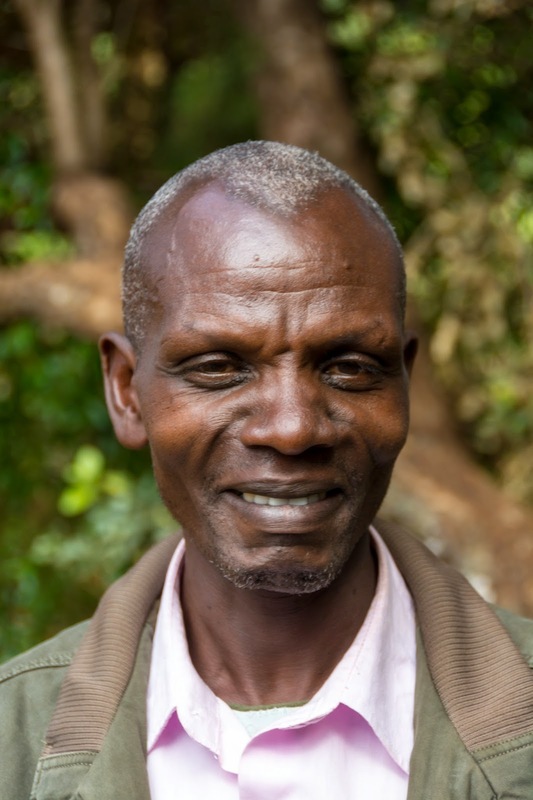 His success extended well beyond the increase in milk production, within the past year Isaac has now been able to afford to pay for his three children to go to private secondary schools and university! All it took for him was a short seminar and advice on growing forages on his own farm. After my three weeks here in Kenya my classmates and I will have assisted with eight seminars for hundreds of farmers just like Isaac. I am confident that the veterinary students of 2016 will hear more success stories from farmers that attended one of our seminars this year. The work we have done here made a tremendous difference for the farmers, cows and families and this is only three weeks of work out of many years that Farmers Helping Farmers been accomplishing. It appears that with education that we can break this poverty trap. But theory is one thing and reality is another. If one person like Isaac can make that much change in their own lives, then just imagine what could happen to an impoverished nation if many more farmers received that key bit of knowledge that was missing. The farmers here in Kenya have the skills and they have the willpower, they just need the information. Whether the poverty trap truly exists or not, there is no denying that education is fundamental for any nation. In Isaac's case, education was the one-time infusion of aid that provided means for his family's prosperity and a new spiral of investing in education for other generations to come. When trying to think about what I should write in this blog, I was given the suggestion of contrasting dairy farming at home to dairy farming here. My instant response was, “you can’t, they’re not even the same thing”. Which seems like an average response having seen both ends of the spectrum. But when I think a little more I realize, how can it be so different when the end product is the same? We have had milk here bought in a carton at the Nakumat, we’ve seen ice cream there as well, and we’ve eaten their yogurt almost every morning at breakfast. Does it really matter that much the means by which it got there? A particular situation that sticks out to me was before one of our seminars where we met with the Chairman of the Naari Dairy Cooperative at their facility, and he showed us around with so much pride. He went into some details about the volume of milk they collect each day, and how often they need to bring it to the processor in Meru. They began collecting only a small number, the exact amount instantly lost from my Canadian brain, which they would cool in their “cooling tank” and bring to the processor every day, or every other day. With the help the received from Farmer’s Helping Farmer’s they have been able to increase the amount collected, which sounds great, and it is, but it did cause a new problem. Their “cooling tank”, which to me is just a simple milk tank like you see on any dairy farm in Canada, could only hold 2000 liters. With their increased collected volume, the tank could no longer hold a whole day’s worth of milk. So they now would have to drive the significant distance to deliver the cooled milk often more than once a day. Which brought up another improvement they’ve made. The collected milk was typically just measured and not cooled at their facility, as they did not have the cooling tank yet. It would then have to be transported to the city by donkey and cart, which could take around 3 hours. We then had to ask if they ever had any spoilage from the heat and the time. The chairman told us it was close to 20% a month. Wow. Again, my Canadian dairy farming brain was in shock. I couldn’t imagine that 20% of milk collected could go bad, just from not having a truck. And that doesn’t even begin to describe what it must feel like for the farmers who only ship 5-10 liters a day. Above that, I didn’t even ask but I’m assuming like other dairy coops we had seen, any milk the farmers would get at night milking was practically waste. There would be nobody to collect it for processing, and no means of cooling it on the farm. So the night milk would have to be used immediately, or would spoil before the morning collection. This then led to the problem of the cows getting milked at odd hours like 6am, 2pm, and 4pm, in order to minimize the volume of the night milk. Unfortunately this also causes leaking and subsequent mastitis problems in the cows. At about this point, the chairman asked us if we had cooling tanks in Canada. Our obvious response was, well yes, and every farm has one. This moment, and his expression of utter disbelief will stick in my brain forever. He was amazed. And I was amazed at his amazement. We then launched into an explanation of how milk systems work on Canadian dairy farms and the collection process, all being by pipeline or suction hose into a refrigerated milk truck. Another moment of shock. I’m still unsure if the shock was over the technology used to do that, or if he was purely shocked at the idea of holding your own milk for 2 days. At the time of this encounter, I had already experienced Kenyan dairy farms for almost a week. I had already seen the “large” dairy farms of 6 cows, and the manual chopping of Napier grass at the more advanced farms. I had fought with farmers to feed more dairy meal if they were even feeding any at all, and seen the tiny, skinny cows hardly ever over 400kgs, all with imported genetics that surely should have resulted in 600kg animals. I saw this and thought I understood the level of resources available here. But it was at that moment I realized I didn’t understand much at all. I realized that things we consider non optional, or standard in Canada, a milk tank to keep 2 days worth of milk in, and a cooled milk truck to collect the milk, were not only optional but a luxury. I know people have always said that North Americans don’t know how lucky they are. But now I am truly aware of how much we take for granted, and how much more I have yet to learn about. The end product is the same, pure wholesome milk; it’s just that us Canadians really have it easy. So next time I’m home and complain about having to milk, I’ll have to remind myself, I could be sitting on a wooden stool without a roof over me. I could be milking a 300kg cow fresh 2 years. She could be giving 3 liters per milking. She might have had mastitis for the past 6 months that I didn’t know how to fix but milked anyways. And I could be thinking about the hour walk I still have to bring the milk to be collected, at which point I could lose 20% of it just because of the heat. I don’t even know how hard it could be.